White cabinets and walls – Taking a cue from our rental, we decided to go with white cabinets and white walls. I hoard (with a vengeance) vintage dishes of all colors and shapes. 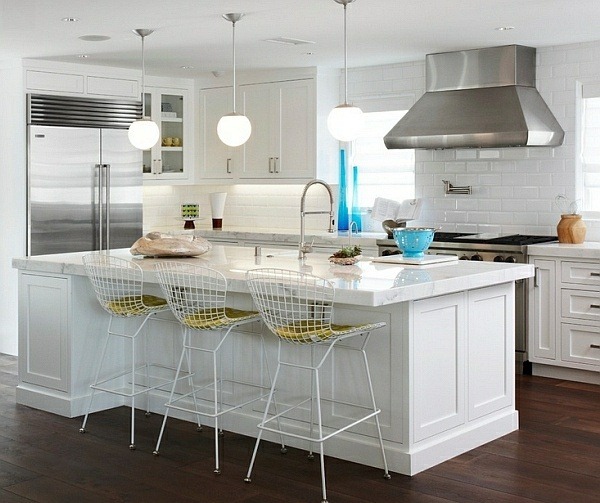 I really loved how they could shine in that kitchen. I also thought it would help with the fresh, bright feeling I wanted in this house. So painting everything white was first on our list. White appliances – Stainless is nice but I knew white appliances, though boring and not fancy, were the correct choice in this situation. I didn’t want my appliances to shine, I wanted them to disappear (and I think many kitchen these days are going in that direction). Emily Henderson did a great post on this very topic recently so check out what she has to say. I couldn’t have said it better, so I won’t. I have been following along with her house renovation as I’ve been plugging along with mine and it was a joy to see her kitchen filled with white appliances (and also depressing because she has gotten so much more done in about the same time frame). After seeing hers, I know it’s the way to go. Now I’m just waiting for my dishwasher and fridge to break (read: roughin’ em up) so I can replace them. White counter – I wanted a bright sparkly smooth counter…some kind of quartz or a recycled composite type. Something easy to clean and visually unobtrusive. This plan has been thwarted for now, story below. 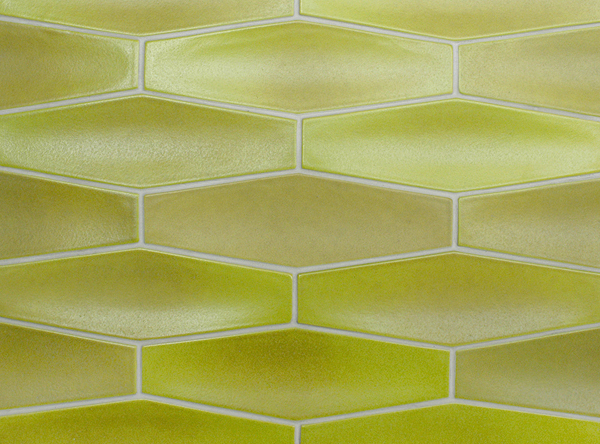 Colorful backsplash – I really wanted color on and backsplash. 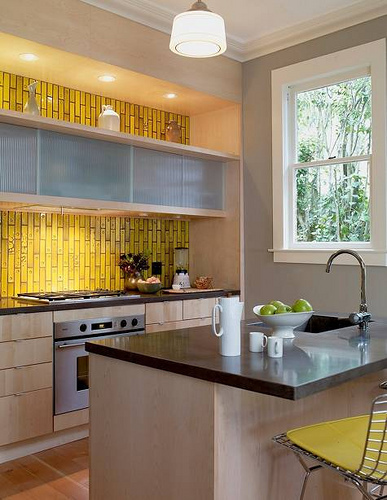 My original plan was to do vivid yellow heath tiles (because LOOK at that backsplash below. It makes bad words spill from my mouth). 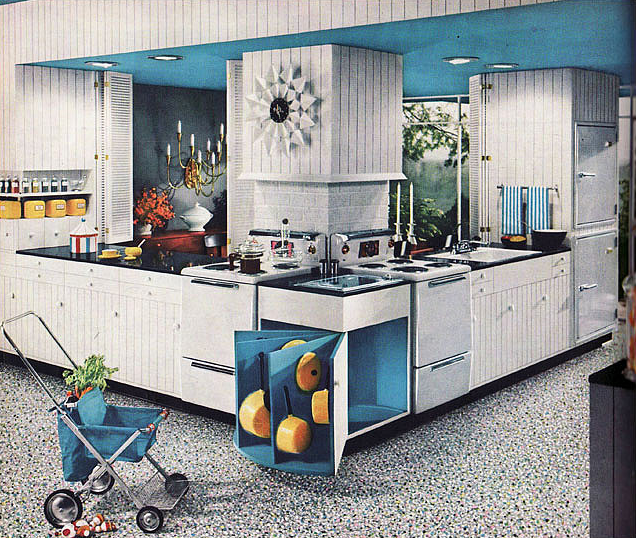 But this plan was quickly derailed when I walked into our house and saw that the counter tops I believed to be beigy and grimy were actually more grayish and immaculate. It felt foolish to waste the time, money and materials to redo perfectly good tiles. So the yellow backsplash has been put on the back burner and may show up in the future during a kitchen redo #2. Which instead turned into a punchy accent – In lieu of brilliant pops of color from tiles, my plan B was an accent ceiling, cabinet, wall or pocket door. We ended up with the pocket door (and laundry room). As you can see, I’m into yellow. Silvertone metal finishes – I really considered doing the whole brass in the kitchen thing (done so well in Emily Henderson’s kitchen above – she has brass “grout lines” in her tile!). I had my heart set on funky vintage cabinet pulls in brass. But I ultimately decided against it. I’m kind of happy about that, for now, since its becoming so ubiquitous. But that’s not why I nixed it. For one thing, I couldn’t find enough vintage hardware pieces that I liked (I needed 43) to pull off vintage. And finding any reasonably priced new but really-really-good-looking brass ones didn’t pan out. Also, I knew the faucet and oven would be chrome (again, I’m sure finding a goldtone faucet today is easier than a year and a half ago since brassy kitchens are popping up exponentially) and I knew that our most used small appliances (blender, toaster, mixer) would be sitting on the counters in all their chrome glory. 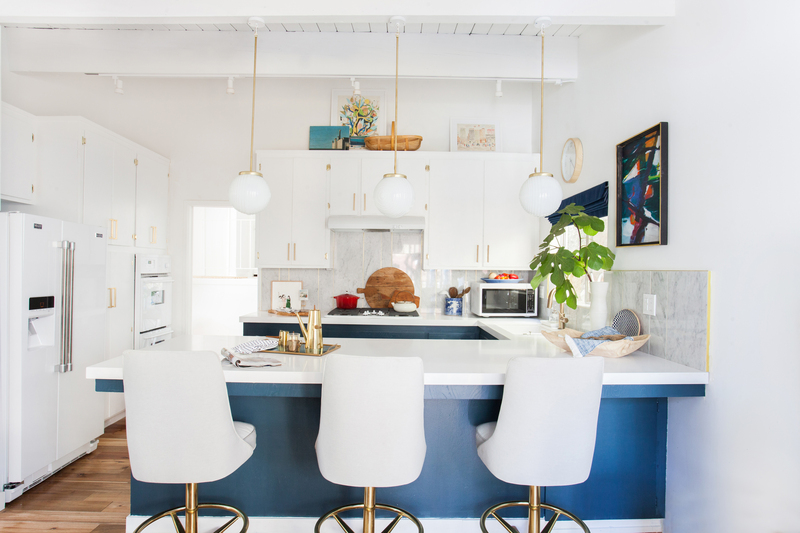 I’m all for mixing metals when it works…and I was thinking it would totally (totally x a million) be working if I had warm brassy pulls to repeat the warmth of my brilliant yellow backsplash. But when that plan was squashed, I decided to add the vintage brass handles to the kitchen redo #2 dream and stick to silvers now because they look really good with the existing grayish tile. But this kitchen below….bangin! 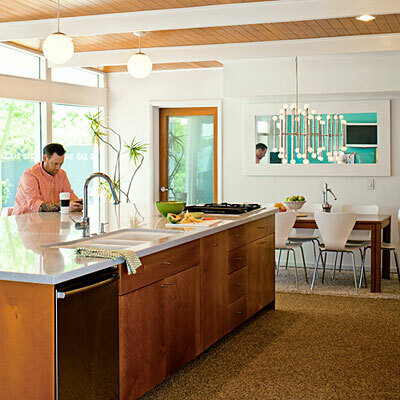 Wood floors – While I wish my kitchen (and whole house) had terrazzo floors, that’s not reality. Since we planned to put wood floors in the rest of the house, laying them in the kitchen was an easy decision. I love wood floors in the kitchen. We are pretty careful with cleaning up water spills quickly so we have never had an issues in that department, yet. They give such warmth to an otherwise hard space and I love how they flow seamlessly and cohesively with the rest of the house. Punchy lights – Given my photos above, there was an obvious answer: big round balls. We have executed most of this stuff, but not all yet. Photos of our kitchen progress are on the way next week. Anyone else working on a kitchen out there and facing similar decisions?